OK: I was not sure I was going to make it through the pilot of Santa Clarita Diet, but once I did, I was hooked. I don’t want to give away too much of what happens in the new Netflix original series, but take a faceless southern California suburb, a married pair of mild-mannered realtors and turn the wife into a zombie. You can kinda do the math, right? Here’s what I will say. Drew Barrymore is a pretty cute zombie. 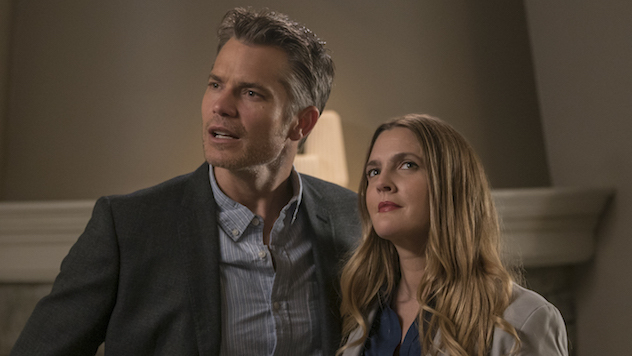 And Timothy Olyphant is great as the husband who really, really wants to keep the family together even though one of them now devours human flesh. I mean, people change in long marriages, right? You deal with it. Together. They’re super deadpan, with flashes of sort of gleeful evil in Barrymore’s case and genuine meltdown in Olyphant’s. Liv Hewson is awesome as the couple’s disaffected daughter, and her nerd-sidekick is deftly played by Skyler Gisondo. I don’t know about you, but a lot of the time there’s only so much human-flesh-eating humor I can take before I start to wish I were watching something else. That didn’t happen to me here. There are enough plot twists to keep you hooked on the story and enough character development to make aspects of the series seem… realistic? No. You never forget for a minute that you’re in Zombie Comedy City. But genuine human sentiment is spliced in adroitly enough that in between the moments of wry humor and outright farce there are layers of nuance and thematic resonance that surprised me more than once. The characters are endearing. Barrymore’s Sheila Hammond is vivacious and funny, even when she’s eating people. Sometimes especially then. And I wish I could meet a guy as passionately dedicated to his marriage as Olyphant’s Joel Hammond. They don’t skimp on the gore, so if that bugs you, expect to be a little on edge if you’re watching this thing. But I found that every time I thought they’d exhausted the trope and was on the verge of losing interest, something happened that I didn’t exactly see coming and got me right back on the farm. Horror-comedy is tough to pull off. I think these guys basically succeed. I am committed to a spoiler-free review, so I will just say: The main upshot is that few things are scarier than a hungry suburban zombie real estate agent. But Barrymore is the most engaging undead person I’ve seen in a long time.